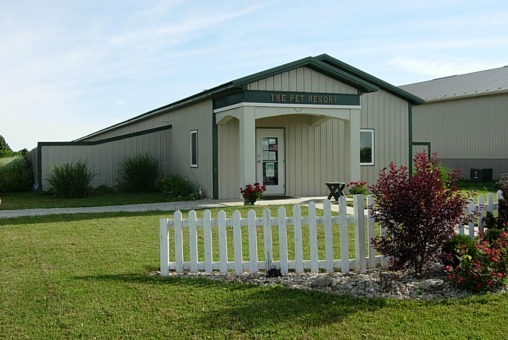 The Pet Resort is located at 307 East 316 North on the east side of Valparaiso, Indiana. FROM U.S. HIGHWAY 30 / STATE ROAD 2 - Take the North exit to Valparaiso, keep right and take the State Road 2 exit. Turn right (east) onto State Road 2. Follow State Road 2 approximately one (1) mile. After crossing the railroad tracks, immediately turn left (west) onto Evans Avenue. After the curve, turn right (north) onto 325 East. 316 North is located on the left (west) side of 325 East just after Pool Pro. FROM 49 BYPASS - Exit the 49 Bypass at Vale Park Road (400 North) heading east. Follow 400 North to the second (2nd) stop sign at 325 East and turn right (south) onto 325 East. 316 North is located on the right (west) side of 325 East just after Pool Pro.